After several cook books and a long-running newspaper column you might have thought that Ottolenghi couldn't come up with any more ways to cook vegetables. But you'd be wrong. Plenty More is his latest offering, again putting vegetables centre stage in all kinds of interesting ways. This book is worth the investment; every recipe I've made from it so far has been a winner. Quantities below served 2 as a light meal. Put the leeks into a large saucepan along with the bay leaves, garlic, wine, olive oil, and water. Season. Bring to a simmer and then cook for 30 minutes uncovered. Turn the leaves half way through so they cook evenly. Remove the leeks from the pan (and liquid) and set aside to cool. Strain the remaining liquid, and if you have more than 3 tbsp cook it on a high heat until reduced. Mix the liquid with the onion, currants, vinegar, sugar and some seasoning, and set aside. Heat the sunflower oil in a large frying pan and then fry the leeks for about 2 minutes on each side (until golden brown). 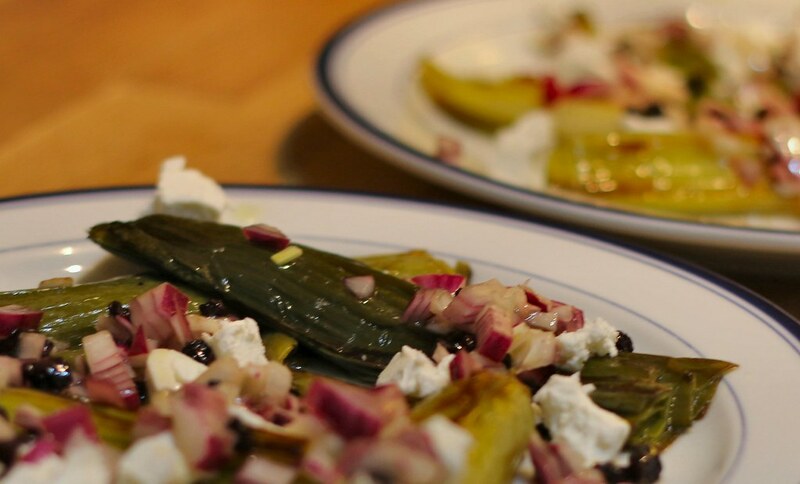 Place the leeks on serving dishes and top with the onion mixture and the cheese (broken into chunks).